With western researchers still finding ways to infuse marijuana in medicine, the Traditional Chinese Medicines (TCM) already has a special place for Cannabis. TCM, a medical system having its origin in ancient China, has stated a few fundamental herbs that can help your body and cannabis fall under these herbs. Despite being among the oldest, the Traditional Chinese Medicine system is widely used and popular in the current generation and it is definitely not going away. Many people choose this system over western medicines as it is different from it in many ways. It has evolved in a span of thousands of years, employing many approaches such as tai chi, acupuncture, qigong, and dietary therapy that help in healing of your mind and body. It is a more holistic approach to complete wellness. It takes into account the five elements of the universe, i.e., fire, water, metal, earth, and wood. Where does Cannabis stand in TCM? For over 1000 years, China has been cultivating cannabis and using it as a root for food, fiber, and medicine. References stating the use of the Cannabis seeds and fiber can be found in many classic Chinese Literatures and most of these uses are associated with medical context. The most profound reference can be the great emperor Shen Nung’s use of Cannabis. 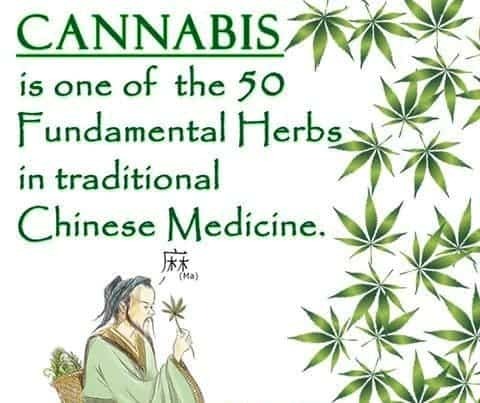 He was also a pharmacologist and regarded Cannabis as one of the 50 major herbs of TCM that can help in treating a varied range of symptoms for many diseases and disorders. Nung, in his book that he wrote back in 2737 BCE, clearly describes an elixir invented from the leaves of the cannabis flower while talking about various treatment methods. Another notable reference is of a book, titled ‘Pen Ts’ao Ching’ that fondly talks about Cannabis plant being a medicine in treating gout, malaria, and rheumatism with other 100 conditions. The older TCM texts also talk about how the seeds have more therapeutic properties than the leaves of Cannabis. We wonder when our governments might let go of their harsh stance and stop placing it with the illegal drugs as all the parts of Cannabis plant are just plain therapeutic with no harm.